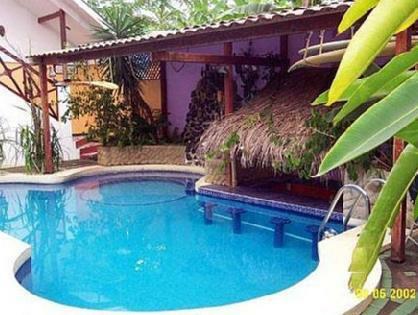 ﻿ Best Price on Hotel Poseidon in Jaco + Reviews! Just 164 feet from Jacó Beach, this hotel has free Wi-Fi connection in public areas, sun terraces and an outdoor pool. Hotel Poseidón is built to enable the easy access for the disabled. The rooms are simply decorated and have colorful motives, plus they feature air conditioning, cable TV and a fridge. The bathrooms have showers and free toiletries. The on-site restaurant serves local and International-style dishes, and the sports bar offers snacks and drinks. Other food options can be found within 1312 feet form the property. At Hotel Poseidón, some of the activities that are suggested for the guests are rafting, canopy, sports fishing and horseback riding. There is a tour to visit the Arenal Volcano that is 2 hours and 40 minutes’ drive away. The Juan Santamaría International Airport is 1 hour and 20 minutes’ drive away. Guests arriving outside reception opening hours are kindly requested to inform the hotel in advance. Contact details can be found on the booking confirmation. From 22:00 until 07:00 there is a security service but reception services are limited. Fue buena, pero definitivamente hace falta el parqueo, hay que ir a buscar donde pagar por horas|para dejar el auto.